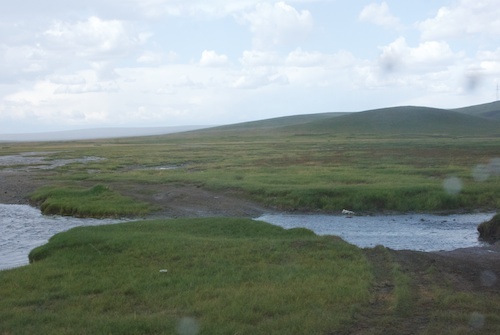 The next leg of the artist’s tour was from Ikh Nart to Gun-Galuut Nature Reserve. 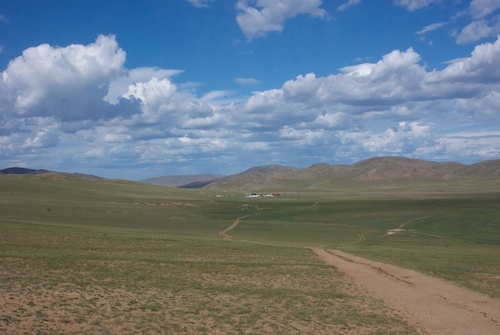 I had only been there once, in 2009, driving east from Ulaanbaatar. This time we were going to go almost straight north…we hoped. 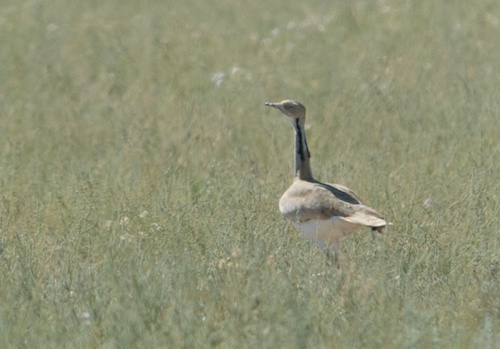 Great bustard we spotted not long after we left the reserve. It was the first time I had ever seen one. 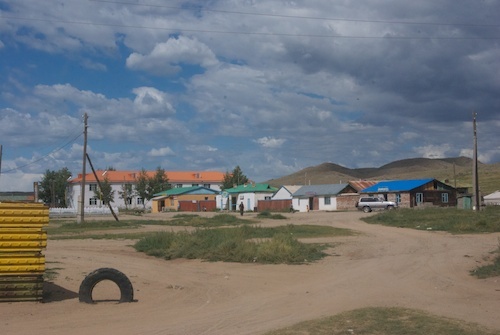 We got back to the main tarmac road between Ulaanbaatar and China and traveled on it for awhile. Then we passed a spot where a dirt road went off to the right at an angle. Khatnaa started to drive on, spotted a white van coming toward the tarmac, stopped, backed up, got out and walked over to them as they slowed down and then stopped. After a short conversation, he came back to the car, backed us up and off we went onto the earth road. He had been able to get enough information about weather and road conditions that he felt ok about taking the “local road”. As usual, this made me very happy. 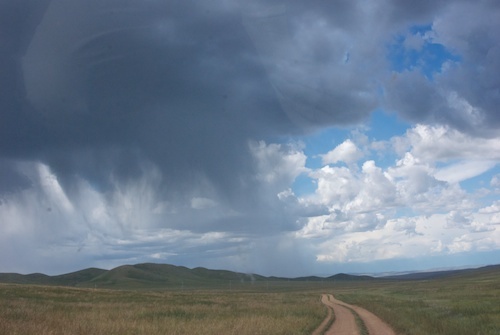 Why you don't just pick up a rental car at the airport and head out into the countryside in Mongolia on your own. You can now get a good road atlas, but it's deceiving because this is what the roads are like all over the country except for a very few wide gravel roads and a slowly increasing amount of tarmac on main routes. We drove through a small soum center. 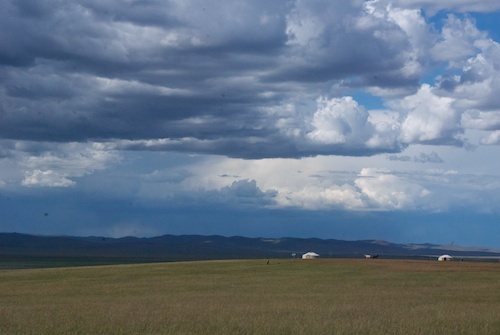 As we headed north, there was a dark storm front to our left and fluffy white clouds and sunshine to our right. The road going north was running right along the front. 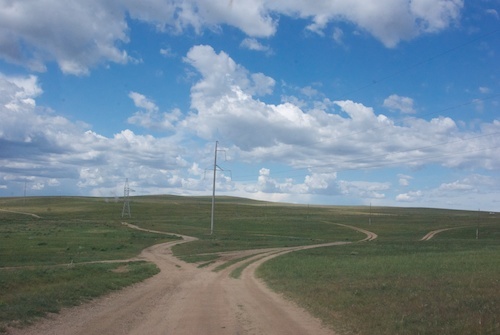 We were out in steppe countryside with no one else around...not a single other car, not even a ger. After some spatters, we found ourselves traveling in pretty heavy rain for about 15-20 minutes and then came to a stream that we had to cross. Now I started to wonder what the road conditions would be up ahead of us. The light was really spectacular, though, as we went up some in elevation and started to see gers again. It had stopped raining where we were, but was still stormy to the west and north of us. Dropping down into a valley and, crossing it, we encountered something I'd seen before....really hard greyish dried mud combined with many very deep potholes. Khatnaa, with extreme care, had almost picked our way through it when we felt the rear end on the passenger side drop down hard, accompanied by a noise that didn't sound good at all. He pulled over on a level spot and crawled under the car. The verdict? The spring (new and Chinese-made) was broken. What to do? We drove on very carefully. VERY carefully. 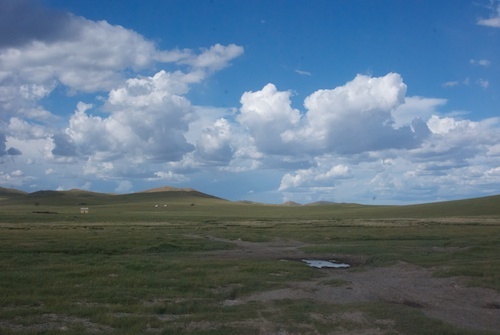 What Khatnaa knew, that I didn't, was that over the rise that you can see almost in the middle in the above photo was our destination, the Steppe Nomads ger camp at Gun-Galuut. With much creaking and care, we made it over the pass and across the valley to the camp. Next week: what happened next….